Oban Celtic have confirmed Dougie MacIntyre has been appointed their new first team manager. Dougie takes over ahead of Oban Celtic’s third season in the Marine Harvest National Division and will be assisted by Les Kinvig who was involved with the Oban Celtic reserves last season. 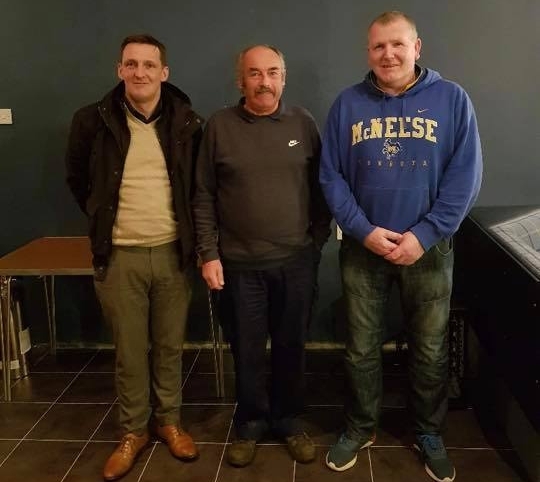 The duo replace Kenny Wotherspoon who stepped down after three years in charge during which he led the side to the Marine Harvest South Division 1 title followed by a sixth and then a fifth-place finish in the Marine Harvest National Division. Although Dougie MacIntyre has not previously managed at a senior level, he can call on his playing days at the highest level with town rivals Oban Camanachd. Oban Celtic’s Davie Hamilton said: ‘Dougie brings with him a wealth of experience from his playing days. He knows how to play the game and can put that across to the boys. I’m sure they will take to him and they’ve been very positive about the appointment. Dougie was one of the finest players of his era and is best known for his days with Oban Camanachd. He played a major part in their 1996 Camanachd Cup success when they beat Kingussie 3-2 in a thrilling centenary final at the Bught Park, Inverness. Oban Camanachd were trailing 2-0 in the final before MacIntyre scored twice to level the match at the break. His brother, Gordon MacIntyre, bagged the winner midway through the second half. Dougie MacIntyre represented Oban Celtic as a youth player in his early days, however. Oban Celtic started training at the Oban High School all-weather pitch on Thursday January 10. The Thursday sessions take place between 7.30pm and 9pm. They have also added Tuesday sessions between 6pm and 7pm at the same venue. Oban Celtic’s first team pre-season programme begins with a match against Glengarry on Saturday February 2, with the venue to be confirmed. They follow that up a week later with the annual Robert Wylie Memorial Cup match when they play Taynuilt at Taynuilt Sports Field. Oban Celtic also take on Inveraray on Saturday February 23, with the venue for that match also still to be confirmed. Oban Celtic have also confirmed they will continue with a second team in Marine Harvest South Division 2 next season. This will give their senior side a valuable back-up and help continue to develop the club’s younger players. Daniel Cameron will again captain Oban Camanachd for the 2019 shinty season. The versatile Daniel is the choice of new manager Stephen Sloss. It will be a second season as skipper for Daniel after leading the side to Scottish Sea Farms Glasgow Celtic Society Cup success last term. Daniel Cameron has been one of Oban Camanachd’s most prominent players in recent seasons and although he missed the 2018 shinty /hurling international against Ireland, he has been a regular in the Scotland squad in recent years. He will be a popular leader in the Oban Camanachd camp. 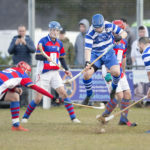 Oban Camanachd will look to better last season’s fifth-placed finish in the Marine Harvest Premiership, as well as defending the Scottish Sea Farms Glasgow Celtic Society Cup. Lochaber have re-advertised for first and second team managers for the 2019 shinty season. The club’s original advert last month hasn’t attracted any suitable candidates so they continue their search for replacements for Lachlan Campbell, who finished last season in charge of the Lochaber seniors, and John Fraser, who led their second team. Despite not having a boss, Lochaber are still putting a pre-season schedule together. They travel to Cannich on Saturday February 9 to play Strathglass with the annual Murdo MacKenzie Memorial Cup at stake. Lochaber will play Skye Camanachd a week later. That match is scheduled for Spean Bridge but could be switched to Pairc nan Laoch, Portree, if the weather isn’t favourable. There are another couple of fixtures in the pipeline, but they are not yet confirmed. Lochaber Ladies have organised three pre-season friendlies, all at home if the weather allows. Glenurquhart Ladies visit Spean Bridge on Sunday January 27 with Fort William and Strathspey providing the opposition the following two Sundays. New Kilmallie manager John Stewart is getting his squad ready for a return to the Marine Harvest Premiership. Training is already under way. It got off to a great start with more than 30 players attending both of the first week’s sessions. Kilmallie have arranged a friendly match against Inverness at the Bught Park on Saturday February 9. Throw-up is at 1pm. They then travel to face Beauly at Braeview Park on Saturday February 16 with a noon start. Kilmallie’s final pre-season test is a clash with neighbours Fort William at Canal Parks on Saturday February 23 with the BSW Cup at stake. It has been a sad time for everyone connected with Kilmallie as, last Saturday, they attended the funeral of Lynsey MacPherson, wife of former manager Mark MacPherson. Many people from throughout the shinty world paid their respects. Skye Camanachd have confirmed their new second team management arrangements for the new shinty season. Kenny MacLeod, who led the side last term, has stepped up to take over the first team along with Allan MacLeod. He has been replaced by a pool of coaches who will look after the reserves. The pool includes David Grant, Iain Murray, David Pringle and Ewen MacKinnon and the monthly arrangement will be co-ordinated by club vice president Thomas Wilson. The model is one similar to that operated by the Kingussie second team last season. Skye will host their inter-island Ewen Morrison Memorial Cup match at Pairc nan Laoch, Portree, on Saturday February 2. They then play Lovat for the George Michie Memorial Cup at Pairc nan Laoch, Portree, a week later. Skye round off their pre-season against Lochaber at Spean Bridge on Saturday February 16, although that match will be reversed to Portree if the weather isn’t favourable. They are then away to Kinlochshiel on the final Saturday of February. Ballachulish will be led by a management team of Morgan Smith and Alan ‘Pele’ Clark in Marine Harvest South Division 1 next season. The club, who will be captained by Cain MacPhee, are putting together their pre-season fixtures. There will be a full house at Glengarry’s annual indoor tournament to contest the Johnstone Rose Bowl at the Nevis Centre, Fort William, on Saturday January 26. Skye Camanachd Ladies were winners in 2018, beating Badenoch and Strathspey in the final. Badenoch and Strathspey were successful 12 months earlier but Skye won the tournament in 2014, 2015 and 2016, making them the team to beat. There will also be a player of the tournament award, won by Skye’s Caitlin Maclean last year. The competition starts at noon. The Johnstone Rose Bowl was donated to Glengarry Girls Shinty Club in 1998 – a year after the team was formed – by Mrs Ailsa Johnstone of DA Johnstone and Son Contractors, Invergarry, which have been loyal sponsors since. It’s same again following Newtonmore’s annual general meeting at the Balavil Hotel. There is no surprise that following a season in which the Newtonmore first team won the Premiership, the Camanachd Cup and the MacTavish Cup, Paul John MacKintosh stays on as first team manager. The Macaulay Cup was the only trophy that eluded the senior side. Newtonmore have pre-season friendly matches against Caberfeidh and Glenurquhart before they welcome Oban Camanachd to the Eilan on Saturday February 23. Paul John MacKintosh will be without the retired Norman Campbell this season and Neil Stewart. It’s the same story with the Newtonmore second string as Orsten Gardner, who led the side to the North Division 1, Sutherland Cup and Strathdearn Cup treble last term, remains as boss for the 2019 season. The Kingussie Young Guns lifted the Bob Sinclair Memorial Trophy with a 5-3 New Year’s Day victory over the Kingussie Veterans at Market Stance. The Kingussie Veterans were winners last year and although Kevin Thain and a John Gibson double meant they were never out of this game, Savio Genini netted twice for the Young Guns with Alexander Michie and Roddy Young also scoring. The Bob Sinclair Memorial Trophy was presented to Young Guns’ captain Robert Mabon by Sandra Sinclair and Donnie Grant. Lovat, fresh from their Lovat Cup win over Beauly, will be one of the first teams in action this pre-season when they play Strathglass at Cannich on Saturday January 19. Lovat have away games at Caberfeidh and Skye Camanachd during the first two Saturdays in February.Fraser Gallacher’s side, boosted by the return of Ryan Ferguson and Mark Kelly and the signing of Fraser Heath, which compensates for the loss of Drew Howie who is abroad, finish their pre-season at home to Beauly on Saturday February 23. That match marks the official opening of the club’s impressive new clubhouse. New Glenurquhart co-managers Stuart MacKintosh and Eddie Tembo have set their side’s pre-season programme. Glenurquhart host Fort William at Blairbeg on Saturday February 9, before welcoming Newtonmore a week later.Glenurquhart are off to Cannich on Saturday February 23 for their annual MacDonald Cup clash. The Glenurquhart seconds also have a busy pre-season as their Inverness counter-parts visit Blairbeg on Saturday February 2. They follow that up with trips to Boleskine, Beauly and Strathglass the following three Saturdays. Glasgow Mid Argyll are looking to recruit new players for the forthcoming 2019 shinty season. The club competes at different levels in both men’s and women’s competitions and would welcome new shinty players of all abilities. The Glasgow Mid Argyll first team, managed this year by former Oban Celtic player Mark Bain, has had their Marine Harvest National Division chances boosted by the news that Oliver MacRae will join them from Kinlochshiel after relocating to the central belt, whilst former Lochaber player John Sweeney is another new recruit. GMA visit Oban on Saturday February 9 when their first and second teams play Oban Camanachd and Lochside Rovers at Mossfield. The Glasgow side follow that up with matches against Inveraray and Kingussie the following two Saturdays. Anyone interested in joining GMA should either leave a private message on the club’s Facebook page or email GMAShinty@mail.com. Ronnie MacVicar continues as Col Glen team manager. Ronnie replaced Peter Kennedy and Brian McNaughton at the start of last season and led the side to a fifth-place finish in Marine South Division 1, only trailing Aberdour in fourth spot on goal difference. The team had finished ninth the year before. Aberdour Shinty Club are looking to recruit senior male and female players for the 2019 season. The club has men’s first and second teams along with a women’s side and a women’s development squad. If you would like to get involved, contact Maggie at aberdourshintyclub@gmail.com or send a personal message to the Aberdour Shinty Club FB page. Inverness announced their annual awards at a dinner dance at the Loch Ness Country House Hotel. With Allan MacLeod compering the evening, Arran MacMaster was named first team player of the year, whilst keeper Colin Fraser collected the second team player of the year prize. The U21 player of the year was James MacKenzie and another promising youngster, Finlay Calder, was the U17 winner. Katie McMillan was the Inverness Ladies player of the year with Joni Kate Reid taking the development accolade. The ladies U16 player of the year was Caitlin Mutch and Melissa MacKay was awarded the U14 prize. Volunteer of the year Drew McNeil as well as Callum McLeod, Graham MacKay and Lynn McNeil were amongst others acknowledged for their efforts.